The pretty E3 Legend of Zelda demo for the Wii U was just that, a demo. Nintendo brought a Legend of Zelda demo to E3 2011 to show off the capabilities of the Wii U, which was basically a more gorgeous (though unplayable) version of a realistic Link from Legend of Zelda: Twilight Princess fighting a giant spider. A hint of things to come? Not necessarily. Similar to the Legend of Zelda GameCube demo that Nintendo showed off in 2000, featuring a realistic Link going up against Ganondorf, the Wii U Legend of Zelda demo is also just a tech demo. 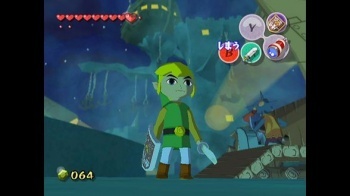 The 2000 showing is notorious for having turned into the cel-shaded Legend of Zelda: Wind Waker, much to the chagrin of people that were expecting a different graphical style. Legend of Zelda producer Eiji Aonuma revealed the news to Wired, comparing the Wii U demo to the GameCube demo. "You probably remember that when we introduced the GameCube, we showed a somewhat realistic Zelda demo," he said. "And what we actually created was the cel-shaded Wind Waker. So when we show a graphic demo, people think, 'Oh, this is what the next Zelda will look like,' but that's not necessarily the case." Aonuma added that we might not even see the functionality of having the menu screen on the Wii U controller while the gameplay is on the TV, also shown at E3. He said that for Zelda on Wii U, he'd like to do things "more surprising than that." Wind Waker sequel on Wii U confirmed? As someone that didn't mind the cel-shading at all, sure, why not? Cel-shaded Link is cute.